Since its establishment in 2011, Fabulous Bingo has been an absolute hit thanks to its responsive design as well as enticing bingo, slots, and mini-games. If its simplistic moniker sounds familiar to you, it’s because the website is fashioned and inspired by Fabulous, the famed weekly magazine that’s handed out free by The Sun. As a matter of fact, this modish bingo site is sister to the renowned Sun Bingo and Fashion Capital Bingo, so you won’t be wrong if you expect glam and glitz from this site as well. The developer behind Fabulous Bingo’s software is Playtech [Virtue Fusion], an industry leader in next-generation bingo technology, regulated markets, and responsible gambling. Bingo and slots fanatics at this betting site are treated to a seamless anytime, anywhere gameplay for an ultimate gaming experience. A first-time glance give an impression that this bingo site is functional and welcoming. Let’s find out if this glamour is skin deep. Shall we? Register with Fabulous Bingo for the very first time, deposit, and spend £10 or more on bingo to receive £20 bingo bonus. This welcome offer comes with x 3 wagering requirement with a validity of 7 days. At the same time, you will also receive £10 to play on side games such as slots and table games. This is side game bonus carries x30 play-through requirement and is also available for 7 days after receipt. On your second deposit, you’ll also receive a boost of 50% match up to £25 as long as you deposit a minimum of £10. This deposit will only be available on slots, must be wagered 30 times, and expires after 7 days of activation. Fabulous Bingo carries a distinctly feminine feel to its design with its effervescent pink and pale blue colour theme and imagery. The layout is very simplistic with everything where you’d expect it to be featuring ‘Home,’ ‘Play Bingo,’ ‘Play Slots,’ ‘Play Games,’ ‘Promotions,’ ‘Community,’ and ‘Help’ sections. That said, although the site has a simple design, it carries a sense of style, and you can expect plenty of glamor. Being powered by Playtech, one of the leading software providers in the industry, punters have every reason to expect the very best of bingo gaming experience. This site offers a selection of bingo games covering 75-ball, 80-ball, and 90-ball versions of classic bingo game. 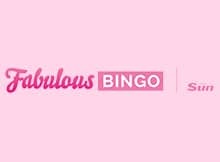 The ticket prices at Fabulous Bingo are modelled to suit punters of different tastes in glitzy bingo rooms such as Sparkle Suite, London Room, New York Room, and Paris Room. Here you also have a chance to be part of some of the biggest networked games across UK, where you can accrue massive winnings from the prize pool. Such bingo games include Cash Cubes, Bouncy Balls, Rainbow Riches, and the famous Deal or No Deal. Every single day bingo enthusiasts have a chance to share a whopping £20,000 with Fabulous Bingo’s Linx games. When you want a break from bingo action, or you are a fan of other casino games, there’s a great selection of slots [also from Playtech and other providers] you can relish. Video slots themed slots, and money-spinning progressive jackpots are featured in the ‘Play Slots’ or ‘Play Games’ tabs on the sites homepage. Expect popular games such as Fluffy Favourites, Dynamite Digger, Battleship Direct Hit, Pigs Feast, Rainbow Riches Leprechauns, Wild Fury, Age of Gods Series, Da Vinci Diamonds, Kitty Glitter, Cleopatra and more. There’s also a small section of table games such as Three Card Brag, Mini Roulette, and Blackjack under the ‘Play Games’ section. Punters can deposit funds to their Fabulous Bingo accounts via Skrill, Visa, Paysafe Card, PayPal, MasterCard, and Maestro. Withdrawals are done via Skrill, Visa, Paysafe Card, PayPal, and MasterCard. Most eWallets withdrawals are completed within 24 hours while credit cards take between 3 to 5 days. If you love the convenience of playing in the go, Fabulous Bingo is impressively optimised for mobile. It’s available via instant-play via your preferred browser, or via a downloadable app. iOS users can download the Fabulous Bingo app from their native App Store while Android users can access the app from Fabulous Bingo site [not from Google Play]. With just a touch of glamour, Fabulous Bingo deals you a relatively whole deck. With a comprehensive bingo games section and above average slots offering, you can say this bingo site delivers more than its feminine, pinkish theme suggests. The site is easy to manoeuvre and works well on both desktop, and mobile platforms cross various prominent operating systems. Why don’t you join Fabulous Bingo and see for yourself if the reality lives up to the promise? The customer service of Fabulous Bingo is operated between 8am – 1am, 7 days a week to assist you with any questions you may have, either via live chat, e-mail or telephone. The platform has an extensive and informative FAQ- section.